For a new wheelchair user, getting familiar with turns and transfers is a difficult process. Here is a diagram from the Americans with Disabilities Act Website, on how to maneuver around a wheelchair bathroom. 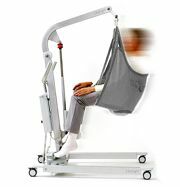 There are two approaches, the diagonal and side wheelchair transfer. Use the proper technique when there is enough space in the bathroom. These wheelchair to toilet transfer techniques will prepare you for any size handicap bathrooms. Diagonal Approach – For tighter spaced bathrooms, 3 to 4 feet in width size. Position manual wheelchair diagonally about 6 inches away from toilet. Swing the footrest out of your way. Lock the brake. Remove armrest. Place one hand on wheelchair seat and other on toilet seat. 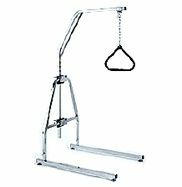 Redistribute weight on hands as you move across. Grab bar handle if necessary and sit on the edge of the toilet. Position yourself on toilet and release the brake. For public bathrooms, you might want to apply the paper on the toilet seat first, since you need the toilet seat as a brace when you make the wheelchair toilet transfer. Side Approach – For handicapped bathrooms about 5 feet in width size. Position wheelchair to the side of the toilet. Remove the armrest and apply the brakes. Use the same weight transfer technique on the hands to sit on toilet seat. 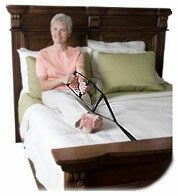 Grab bar handle to adjust your seated position on toilet. Optional: Use a handicap transfer board as a bridge to make the process smoother and safer. 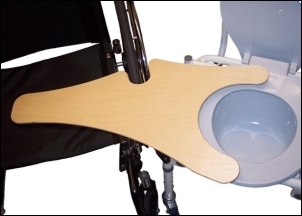 To make your toilet transfer a lot easier, many people purchase toilet transfer benches or handicap transfer boards that hooks onto your wheelchair and creates a bridge connecting the toilet seat to your wheelchair. As you can see, there is a notch on one side of the board to lock onto the arms or wheels of the wheelchair. There are other transfer boards that simply provide for a flat surfaced sliding board between two points. 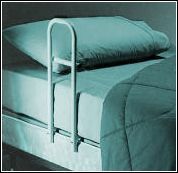 Another alternative to help your wheelchair toilet transfer is to obtain some grab bars. 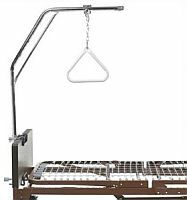 You can see a wide variety of grab bars, transfer boards and toilet transfer benches by visiting our store.